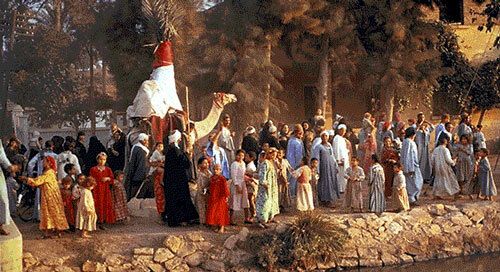 An Islamic wedding procession in Egypt leads the bride to the home of the groom. The bride, hidden from view in a tentlike covering, is riding the camel. Elaborate processions like this one are chiefly a rural tradition of the Islamic wedding ceremony. Marriage has special importance to Egyptians. They consider marriage as the most important event in their lives because it means a moral way of psychological and biological satisfaction. Egyptians assume marriage is the main method to protect youth from any sacred relationships; moreover, marriage reinforces society's relationships. Marriage is a religious imposition, and we can find many parts in the Quran as, well as prophetic instructions, which encourage getting married. There is no doubt that marriage customs indicate the society's culture, behaviral patterns, thoughts and feelings. Now let's indicate some Egyptian marriage customs in the past and present and their main effects. The ancient Egyptians were the first people who stated marriage laws in the world. They regarded marriage as a civil and legal relationship. Marriage in ancient Egypt was a religious imposition. The ancient Egyptian laws organized the marriage relationship and indicated all rights and duties for the couples. Many of the old marriage contracts have been found, and they were registered and signed by three officers. The ancient Egyptian laws gave the right of divorce to women as well as men. The wife was respected greatly, and she had high prestige. The couple had a lot of chances to get to know each other before the engagement; for example, in the temples or at the common feasts. There was a custom in the Egyptian family which allowed the adult daughter to welcome the guests who came to visit her parents. The ancient Egyptians knew the engagement before getting married, and its customs were similar to the engagement customs in Egypt's countryside nowadays. It started by the suitor's parents visiting to his fiancee's house to get her family approval to complete this marriage and reaching an agreement, which contains two main items: an amount of money, called Mahr, paid by suitor to his fiancee's family to help them prepare the furniture of their daughter and a valuable jewelry gift, called Shabka, given by the suitor to his fiancee. The value of this gift depended on the financial and social levels of the suitor"s family. When the two parties completed the agreement, they fixed an appointment for the engagement party. Most of relatives and friends attended the party in one of the common banquet halls, which was decorated with several kinds of flowers and lights. The fiancee wore the engagement dress which was simpler than the wedding dress and its color was blue or pink while the groom put on the finger of his fiancee a ring, the ancient Egyptians' gift to the old and new world,which was a symbol of immortality. In addition, the groom gave his fiancee the valuable jewelry gift agreed on before. During the party, the attendands ate and drank several kinds of food and drinks. When the house of the new family became ready, the two families fixed an oppointment of the wedding party. The night before wedding day, the relatives, the friends and the neighbors got together to celebrate the "Henna Night". The women went to the bride's house, while the men went to the groom's house. At the bride's house the women danced and sang all night while the bride wore a pink dress made with silk or cotton fibers, and her hands and feet were bleached with henna. Meanwhile, the men danced and sang all night at the groom's house, and the groom wore an expensive clean suit. After sun set, the wedding party started, and the couple wore their best dresses and jewelry. 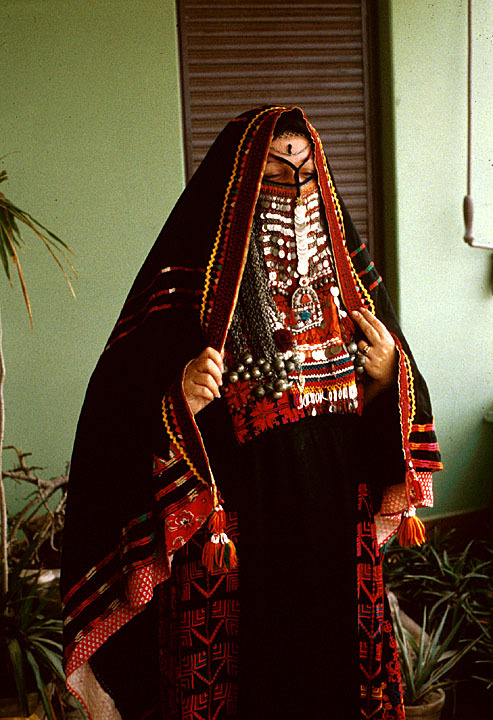 The bride was transferred to her new house on a horse or a camel with a musical band, and the attendants sprayed the cortege with green wheat as a symbol of fertility. Several kinds of cooked meats as well as vegetables and fruit were prepared for the attendants, who danced and sang with music all night. In the morning, the wife's mother and her sisters visited her and gave her some food. The wife's friends and relatives visited her after seven days from the date of her wedding party, and they offered gifts and some food, while she gave them some sweets and fruits. Ancient Egyptian marriage customs are the most effective marriage customs in Egypt's history although Egypt has been exposed to many civilization, such as, Greek, Roman and Islam. The Islamic marriage doctrines are very simple, they are basically two factors. First, the acceptance of the couple, or their representatives, each other to be husband and wife is the most important term for marriage. Second, the publicity of the marriage (making it known to the people) is an essential condition of marriage; however, Islam emphasizes that marriage is the only available way to satisfaction the biological need between the man and the woman and to make the family; therefore, the available chances for the couple to get to know each other before the engagement have become limited, mainly through family visits or at public places. The engagement and wedding customs in the Middle Ages remained as they were in Ancient Egypt although these customs are in disagreement with the simplicity of the Islamic spirit. Nowadays, the marriage customs in the Egyptian countryside are similar to the ancient customs, but in the city the picture is quite different, where the couple has many chances to get to know each other at university, work, clubs and other public places. However, the engagement agreement between the families still includes the two main items: the "mahr" and "shabka"; furthermore, the engagement party is quite similar to the engagement party in Ancient Egypt. Frequently it is held in one of the hotels. However, the engagement period has be come longer because of the preparation of the new house is costly and does not suit the income of the couple or the income of their parents (housing is very expensive in Cairo). The marriage contract is signed and registered by "maazon", a man who has an official license to sign and register the marriage contract, in attendance of the couple and their families and friends, and this procedure happens in the birde's house or at a mosque. At the wedding party, the bride wears a while dress with a white mantilla while the groom wears a black suit with white shirt and necktie, and in the hotel the couple walks among their invitees from the entrance of the hotel to their seats, and infront there is the music band. The attendants spray flowers over the couple. When the couple takes their seat the party program starts with a drink called "Sharpat",a rose water juice, and after that the singers and the dancers start to present their shows, and in the middle of the party the couple cuts the wedding cake and opens the food buffet. When the party finishes early morning the couple thanks the guests and either the couple goes to their room or they go to their new house. Egyptian marriage customs in the past or in the present generally reflect the cooperative and brotherly spirit of the community; however, we should get rid of our bad marriage customs and habits because they cause a lot of serious problems for society. The marriage between relatives (i.e. first cousins) is one of our bad customs in Egypt. Although marriage between relatives is a very old custom, it is still common in Egypt, and there are many reasons behind this kind of marriage. First, increasing the family size and consequently the power and the prestige of the family is the most important reason. Second, keeping the family's heritage and wealth among its members is another important reason. However, marriage between relatives has many disadvantages like hepartinson and diabetes (in the children). Furthermore, marriage between relatives causes tribal racism giving the chance for power struggles and superiority fights. Another bad custom is that the marriage customs in Egypt are costly and do not suit the income levels of most Egyptian families; for example, the average of marriage cost in Egyptian cities is LE 100,000 ($ 30,000) while the average income is LE 150 ($ 44) per month. This situation creates heavy load on the young couple and their families. I think although our marriage customs indicate deep emotions between the Egyptians, and illustrate the great civilization, we should work hard to minimize customs by organizing social campaigns to clarify our marriage custom's disadvantage. In addition, we should spread education and concern for women's education , especially in the countryside. In my opinion, if we do not get rid of most of our bad marriage customs, our problems will increase cutting off any economic growth and decreasing the development of the society..